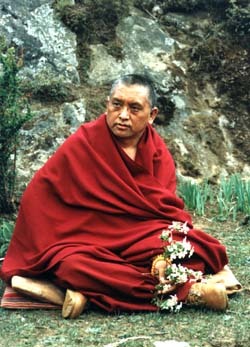 From time to time whilst giving teachings at various centers around the world, Rinpoche would tell stories of his childhood: in Thami, then in Tibet, where he went when he was ten, and finally India, where he first met Lama Thubten Yeshe, with whom he would remain as heart disciple until Lama passed a way in 1984. Compiled and edited by Ven Ailsa Cameron. This article appeared in the November-December 1995 issue of Mandala. I would sit a little way up the rock and pretend that I was giving initiations. I didn’t know any prayers, so I would just make some kind of noise and pretend I was praying. At one point, when I could write Tibetan letters by myself (we didn’t have pens, so we wrote on pieces of paper with charcoal), I wrote to my mother without my uncle knowing about it. I had a sneaky mind, so because I wanted to go home I told my mother that she must write to say that I should come back home. I gave the letter to someone who was traveling to Thami, but a funny thing happened. When he reached my mother’s place, he could not find the letter. He had carried it in his leather shoes, and he must have dropped it when he stopped along the way to shake the snow out of his shoes. With my uncle teacher I went back and forth between Thami and Rolwaling three or four times. He carried me on his back and gave me food, which he had prepared before we left home. As we walked he passed the cooked meat and other food back to me. Only once was there an avalanche, a small one. The luggage was scattered all over the place and the people fell way down the slope, but they weren’t worried. They were singing songs when they came up to collect their things. There was a very dangerous mountain with water running down it and rocks, huge and small, constantly falling. The huge rocks would come down wooroodoo! and the small rocks would drop tiiing! There were a lot of different noises. It was terrifying. I don’t know why, but every time we art we would stop and everyone would drink alcohol, the strongest one made from potatoes. The Sherpas make about thirteen different foods from potatoes, which is their main food, and one of the things they make is very strong alcohol. In Solu Khumbu it is the custom that most of the people, including many of the monks, drink alcohol, though there are some who do not drink. So everybody would drink some alcohol, then generate heat by rubbing their hands together. They were then able to carry their huge loads across, usually two or three square butter tins, plus their food and blanket and things to sell. Just hoping that it would be all right, they crossed, climbing up through the water and rocks to the top. We went back and forth several times, and somehow no rocks fell while we were crossing. However, every time we were resting and drinking after reaching the top of the mountain on the other side, the rocks would come down woorooroo! Many times I thought, “Oh, somebody will be killed.” But every time, the rocks fell right after the last person had crossed. All the way across everybody recited whatever mantras they knew. The main sect in Solu Khumbu is Nyingmapa, so most of the people recited Padmasambhava’s mantra with single-pointed concentration. I don’t remember what I did during that time, whether I recited any mantras or not, but I do remember that I was carried by my uncle. Of course, as soon as everybody reached the other side, where there was no danger, all the prayers stopped. On the other side of the river was a very nice grassy place where Western trekkers used to camp. In the summertime and in the autumn, tourists would come to Rolwaling—not all the time, just sometimes. Sherpa porters would guide them there and sometimes bring them to my teacher’s house, or sometimes we would go down to see them in their tents. Once or twice I went there to see them. The bridge crossing the river to that spot was just two tree trunks tied together. You had to walk on that, and it wasn’t very wide. One day I went to give some potatoes to the Westerners in their camp—I don’t remember who they were. My teacher told me not to go, but I think I pushed him; somehow I really wanted to go to give the Westerners the potatoes. So, my teacher put some potatoes in a brass container used for eating rice or drinking chang, the local beer, and off I went, alone. I walked onto the bridge. The river was quite wide and when I reached the middle of it, in my view the bridge tilted, and I fell into the water. My head came up, then went down again. According to what my teacher told me later, at first I was facing upriver, along by then later down river. I was carried along by the river, with my head coming up from time to time. All the time I was closer and closer to danger, to where river was very, very deep. One time when my head came up, I saw my teacher running towards the river from the monastery, which was quite far away. There was some flat ground, then a huge mountain with the monastery a little way up it. I saw my teacher running down the mountain to the flat ground, holding up the simple cloth pants he was wearing. I was about to reach very deep water where it would have been very difficult for my teacher to catch me, when he finally grabbed me and pulled me out. I was dripping wet. I’m not sure, but I think he said, “I told you not to go!” I think the fact that I fell into the water and dropped everything, the container and the potatoes, must be a shortcoming of not listening to my teacher. I later heard from some people who were watching that one of the Western tourists came with his camera and was taking pictures as I was being carried along by the water. I stayed in Rolwaling seven years, memorizing prayers and reading texts, including all the many hundreds of volumes of the Buddha’s teachings, the Kangyur, and the commentaries by the Indian pandits, the Tengyur. Lay people would ask us to read these as a puja, so my teacher would read all day long. I don’t know how long they took to read—many months, I think. Sometimes I went outside to go to the toilet and would spend a lot of time out there, just hanging around. I didn’t return to the reading very quickly. After seven years, when I was about ten, I went to Tibet with my two uncles. The reason for our journey was to visit another of my uncles, who was living at Pagri, a major trading center. First we walked from Rolwaling to Thami, then from Thami to Tashi Lhunpo Monastery, and finally to Pagri. I have an idea that the journey took us six months, walking every day. Because I was quite small, I didn’t have to carry anything; my uncles carried everything. I spent seven days at Tashi Lhunpo, the Panchen Lama’s monastery, but from the time we left Solu Khumbu, my heart was set on going to study at the greatest Nyingma monastery in Tibet, Mindoling, because all the Sherpa monasteries are Nyingma. My plan was to go to this monastery and practice. There were many other monasteries along the way, but somehow I had no particular desire to live in them. Earlier, when I was seven or eight years old, I had read Milarepa’s life-story three or four times, mainly to practice reading the Tibetan letters. Somehow at that time my mind was very clear, and I had a strong desire in my heart to be a really good practitioner by finding an infallible guru like Marpa, just as Milarepa had. At Tashi Lhunpo I met Gyaltsen, a Sherpa monk who was like a dopdop; he had a black shamtab covered with butter and always carried a long key. He didn’t seem to study or go to pujas, but mainly traveled back and forth between the monastery and the city. My two uncles were there with me, and one other Sherpa man. We didn’t go to the pujas, but got into the line of monks to get the money when the pujas finished. I think Gyaltsen probably guided us. On the very last night before we were to leave, Gyaltsen insisted that I stay and become his disciple. I don’t think I had any sleep that whole night! I was wondering how I could escape from this because both my uncles agreed that I should stay there and become his disciple. But I had not the slightest desire to become his disciple, couldn’t think of how to escape, of what I could do the next day. Fortunately, the next morning, my uncles finally agreed that I should go with them to Pagri. Because my uncles were away he talked to my uncle’s wife, and she accepted his suggestion. The next day she made a thermos of tea, filled a Bhutanese container made of woven bamboo with round breads (she made very good Tibetan bread, served with a lot of butter) and took me to the monastery where the manager lived, just a few minutes walk from where we were living. When my uncles returned from Lhasa, they wanted me to go back with them to Solu Khumbu. I said that I wouldn’t go back. My second uncle, the one with whom I spent seven years, was very kind—although at that time, I didn’t know he was being kind. He beat me. When I rejected the idea of going back, my other uncle—the one who lived in Tibet and was a businessman—brought out a whole set of new robes with brocade, which he had bought in Lhasa, horse decorations everything! He piled everything up and said: “If you go back to Solu Khumbu I will give you all these things; otherwise you won’t get anything.” Somehow I didn’t have much interest in those kind of things at that time. I don’t remember having any strong attraction to the things he was going to give me if I agreed to go to Solu Khumbu. Because I rejected the idea of going back to Solu Khumbu, my manager went to check with one of the most powerful men in that area, a secretary to one very rich and famous family, great benefactors of Demo Geshe Rinpoche’s monastery. When my manager asked his point of view, the secretary said that I should be sent back to Solu Khumbu. The district judge arrived and I was called in front of him, naked (I don’t know why I was naked—I’ve forgotten that part of the story), and because the shrine room where I was kept was very dark and very, very cold, my whole body was shaking. The judge said that I had the right to make my own decision as to whether to stay or go. So I spent three years in Pagri, doing pujas in people’s houses every day, and I took getsul ordination there in the monastery of Demo Geshe Rinpoche, who is regarded as an embodiment of Lama Tsongkhapa. I wasn’t a monk before that. I saw many monasteries, but somehow because of my karma, I became a monk only in that Gelugpa monastery. In March 1959, the Chinese took over Tibet, but because that area is close to India, there was no immediate danger. Later that year I was instructed to do my first retreat, on Lama Tsongkhapa Guru Yoga, at a nearby monastery called Pema Chöling, a branch of Demo Geshe’s monastery. I didn’t know anything about the meditation; I just recited the prayer and some Migtsemas. I think I finished the retreat, but I don’t know how I did it or what mantras I counted. Eventually we reached India. We went to Buxa Duar, in the north, where the Indian Government housed the monks from Sera, Ganden and Drepung Monasteries who wanted to continue their studies, along with monks from the other sects. All the four sects were put together in that one place. During the time of the British, Buxa was used as a concentration camp, with both Mahatma Gandhi and Nehru being imprisoned there. Where Mahatma Gandhi had been imprisoned became the nunnery, and where Nehru had been imprisoned became Sera Monastery’s prayer hall. Because there was a branch of Demo Geshe’s monastery in Darjeeling, my plan was to go there. However, the head policeman at Buxa sent all the other monks in my group to Darjeeling, but for some reason stopped me. He said one other monk should stay with me in Buxa. It was because this policeman didn’t allow me to go to Darjeeling that I came to study there at Buxa. I don’t know why he stopped me from going to Darjeeling—it wasn’t because he received a bribe. At Buxa I, as well as many other monks, caught tuberculosis because of the poor conditions and climate. I was invited to Delhi by the second British nun, who was called Frida Bedi (the first English nun died in Darjeeling). She visited Buxa, where all the monks lived together, and she visited especially all the incarnate lamas. 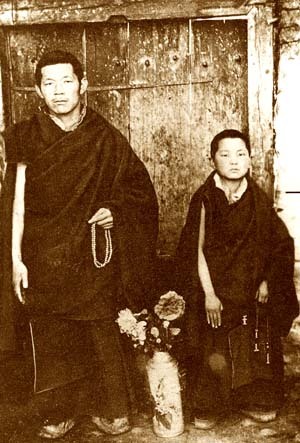 She invited many of the incarnate lamas to a school she had started to teach them English. Hindi was also taught, but I think her main aim was to teach English. I spent six months in Delhi, and it was at that time that I developed TB. First I caught small pox and had to stay fifteen days in the small pox hospital, which was very far from the school. When I came back, I got TB, and then went to the TB hospital. I cried three days in that hospital. The reason I cried was that there was no opportunity to learn English. At that time I somehow had a great ambition to learn English, so cried for three days and wouldn’t speak to anyone, not even the Indian boys staying in the same ward. When I went into hospital, I had to change into hospital clothes, pants and a shirt. In the break-times, I would go outside, where I could see the passing traffic through the fence. I would stretch my legs towards the fence, put my English book between my legs, and then I would cry. The Indian boys would gather around and tell me, “Lama, don’t cry. Don’t be upset!” but I didn’t speak to them for three days. In the old men’s ward I met one very nice Indian man, who agreed to teach me English. I had a book that contained normal conversational English, given to me by Thubten Tsering, His Holiness Ling Rinpoche’s secretary. I liked this book and I used to go to see this Indian man in his bedroom and learn some of the words. Then I got better. I then returned to Buxa to continue to study. I did a little debating, but more like playing. Unfortunately I don’t think I have created much karma to study whole texts. I have received teachings on some of the philosophical texts, so some imprints have been left on my mind. At that time I think I spent more time learning English, but in a useless way, because I tried to collect and memorize English words the way we the whole dictionary by heart. At that time I think I spent more time learning English, but in a useless way, because I tried to collect and memorize English words the way we learn Tibetan texts. I once thought to learn the whole dictionary by heart. The Tibetan way of learning involves a lot of memorization, so believed that if I memorized a lot of words, it would be okay. I didn’t know that you have to concentrate on the accent and train in speaking. In any case there was no opportunity to practice in Buxa, apart from using a few words if you met some Indian officials. I memorized many, many words from different books, and all the Time magazines. I would forget and then memorize them again, forget and memorize again, forget and memorize again, just as with the Tibetan texts. I spent a lot of time doing this but it was useless; it wasn’t the way to learn English. At Buxa I was taught by Geshe Rabten Rinpoche, whose kindness is responsible for whatever interest in meditation practice I now have. An it is because of the kindness of Geshe Rabten that I recognized my root guru [Kyabje Trijang Rinpoche]. Geshe Rabten taught on emptiness and samatha meditation, and even though I was very small I was interested. I tried to meditate on my bed after the mosquito net had been put down. I used to meditate on the silver cover of my Tibetan tea bowl, even though I didn’t know how. I tried to meditate one-pointedly, but I fell down! I don’t know what happened; my whole body fell completely. It happened several times and eventually I gave up. Anyway, in that house there might have been a small impression from a past life. This is why I have some interest In lam-rim, more than in meditation practice. Anyway, after this Geshe Rabten was very busy and sent me to another teacher from Kham whose name was Yeshe. From this teacher I received the meditation and visualization on Ganden Lha Gyema, and on the kindness of mother sentient beings from the part of the Prajnaparamita scriptures dealing with that subject. There was no text so the teacher Yeshe had to say it by heart. I hadn’t learned Tibetan writing in Tibet, just studied it myself so that I could read, and so I copied everything down. Then this teacher Yeshe wanted to lead a different life, so he left Buxa to wander around and stay in various places in India.